경기도 하남시 춘궁동에 있는 5층 석탑으로 2단의 기단(基檀) 위에 5층의 탑신(塔身)을 올린 모습이다. 기단의 네 모서리와 면의 가운데에 기둥 모양을 새겨두었는데, 남쪽 면이 부서져 있어 그 안쪽으로 커다란 기둥돌이 들여다 보인다. 이 탑의 특징은 탑신부에서 드러난다. 첫층 몸돌이 2단인데, 아랫단을 4개의 네모난 돌로 두고, 그 위에 1장의 돌을 얹어놓았다. 이러한 예는 (전)광주 성거사지 오층석탑(보물 제109호)에서도 볼 수 있는데, 고려시대에 나타난 새로운 양식이다. 지붕돌을 구성하는 돌 역시 1∼3층은 4장, 4층은 2장, 5층은 1장이다. 지붕돌은 밑면에 1층은 5단, 2∼4층은 4단, 5층은 3단의 받침을 두었는데, 이러한 구성은 탑신부가 위로 갈수록 강하게 체감하는 느낌을 갖게 한다. 지붕돌 아래는 수평을 이루어 반듯하며, 경사는 완만하면서도 네 귀퉁이 선이 뚜렷하게 치켜올려져 있어 경쾌하다. 탑의 꼭대기에는 머리장식으로 노반(露盤:머리장식받침)만이 남아 있다. 구조상 불규칙적인 면이 많지만, 각 부분의 끝맺음마다 규칙성이 느껴지고, 탑신의 비례도 조화로운 우수한 작품이다. 지붕돌 모서리의 치켜올려진 정도나 기단을 2단으로 구성한 점 등 통일신라 후기 석탑양식의 전형을 따른다고 볼 수 있다. 다만, 지붕돌 받침수가 3∼4단으로 줄어든 점이나, 기단의 가운데에 새긴 기둥의 수가 줄어든 것 등으로 미루어 고려 전기인 10세기 후반에 만들어진 것으로 보인다. 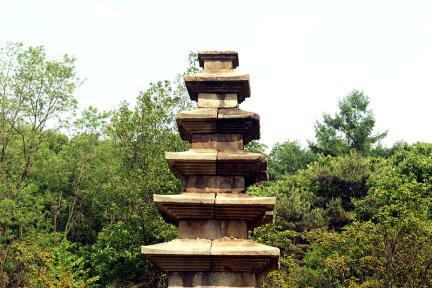 This square five-story stone pagoda, atypically consisting of a two-story platform and a five-story main stone body, is located in Chungung-dong, Hannam, Gyeonggi-do. 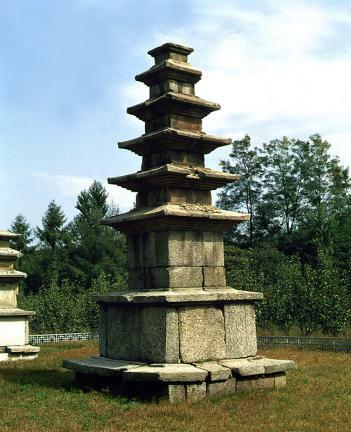 (Generally, pagodas are composed of a platform, a body consisting of a main stone and a roof stone, and a finial.) 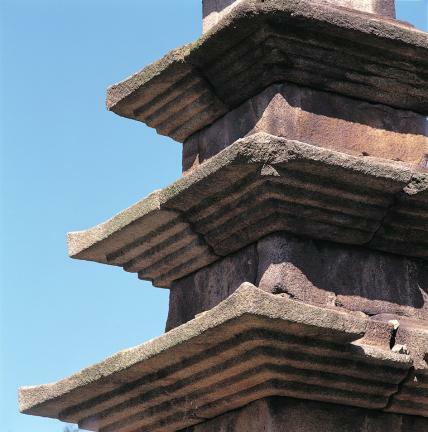 The platform of this pagoda features carvings of columns on its four corners and the middle of each side. 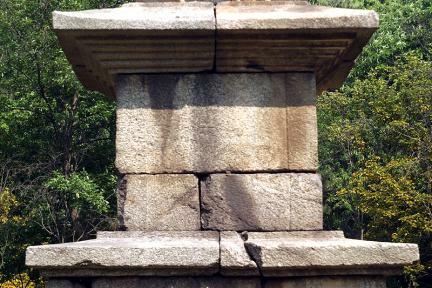 As its south face is broken, the stone column inside the platform can be seen through the break. 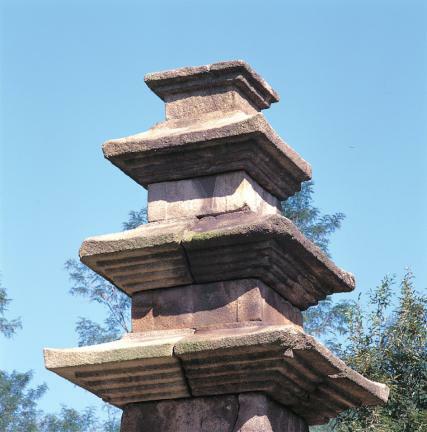 The unique feature of this pagoda is the structure of its body. 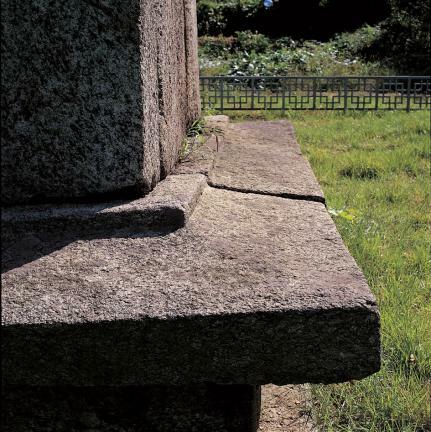 The first story of the main stone body has two steps, on the first of which are laid four square stones, with another flat stone laid upon them. 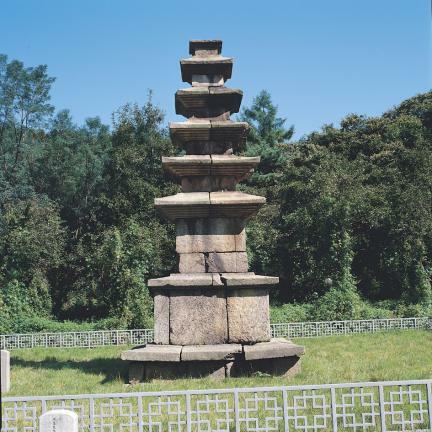 This style, introduced during the Goryeo Dynasty, can also be seen in the Five-story Stone Pagoda at Seonggeosa Temple Site in Gwangju (Treasure No.109). 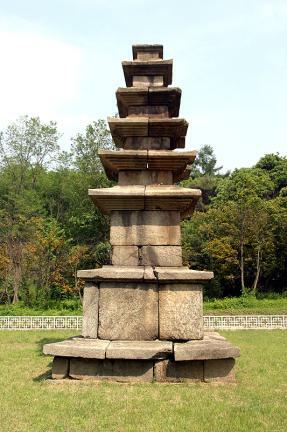 As regards the roof stone, there are four steps on the first to third floors, two on the fourth, and one on the fifth. The stone supporting the roof stone also has a decreasing number of steps (falling from five on the first floor to four on the second-fourth floors, and from four to three on the fifth floor). This structure gives the impression of a gradual upward tapering of the body. 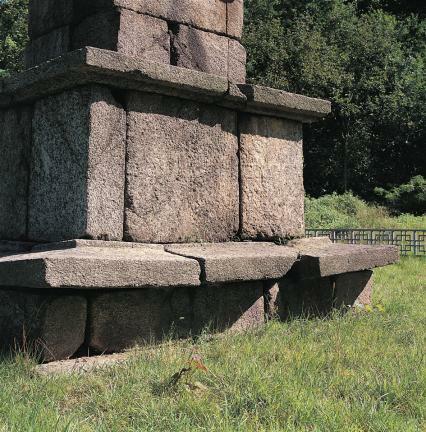 The lower line of the roof stone is horizontal, while the edge is turned slightly upward. All of the finial, apart from its base, has been lost. Though it displays some structural irregularities, it is a great work characterized by the harmonious proportions of the body. 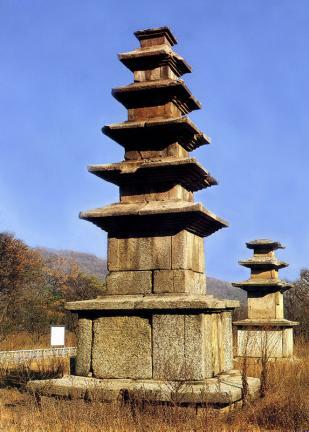 It shows the influence of the style of late Unified Silla in the two-story platform and the degree of lift of the edge of the roof stone. 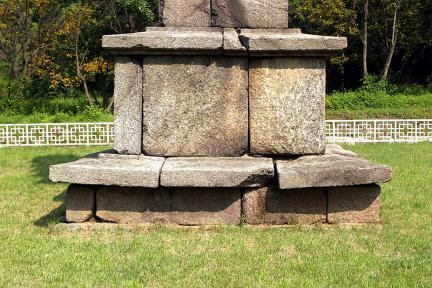 However, the decreasing number of steps on the roof stone and the columns carved on the middle of the platform suggest that it was made in the late 10th century (early Goryeo Period).